“Help”, the second ‘acted’ film from The Beatles, has now been released on both Blu-ray and for digital download from iTunes. Both “Help” and the earlier – and better – “Hard Day’s Night” were directed by Richard Lester. “Help” is essentially a succession of music clips punctuating a James Bondesque romp set in London, Austria and the Bahamas. Those locations show that “Help” had a bigger budget than its England-bound predecessor, as does the fact that “Help” was filmed in colour. “The Beatles in Help! 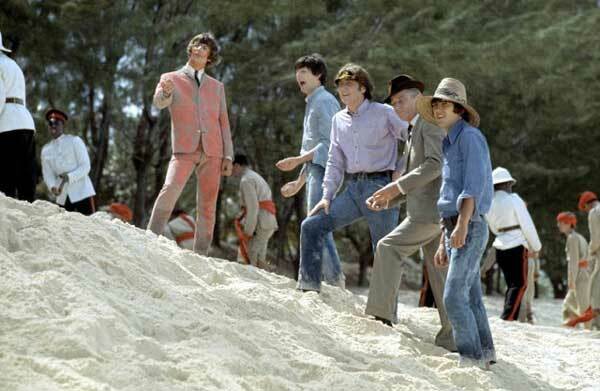 – a 30-minute documentary about the making of the film with Richard Lester, the cast and crew, including behind-the-scenes footage of The Beatles on-set. Help is selling on iTunes for $24.99, while the Blu-ray version can be picked up in stores for a little under $30. Once you bought it, why not have a little fun and see if you can pick the signs of the four Beatles being stoned – marijuana was an enthusiastic hobby for them in 1965.